It's that festive time of year. Well, as it is now that festive time of year, I thought that it was only fitting on this nice crisp Christmas morning, that it was time for some merriment and put a few things of that nature on the Blog today, I didn’t want to celebrate the season too early, seems like people start way to early these days, but now is the right time to get you lot into the Christmas spirit. Have a great day today and hope that world flies by faster than Santa with a Rocket powered sleigh! A bit of JD Mc Pherson now. Jeez I feel old seeing these. Ha Ha. Irelands Imelda may knocking this one out of the park. This is for those who run out of time and of course idea’s for that certain someone at christmas and not sure what to buy for them. So, let me take this opportunity to wish you ALL a very Merry Christmas, thank you for all your orders, inquiries and phone calls. Hoping 2016 find you good health, great wealth and of course happiness. 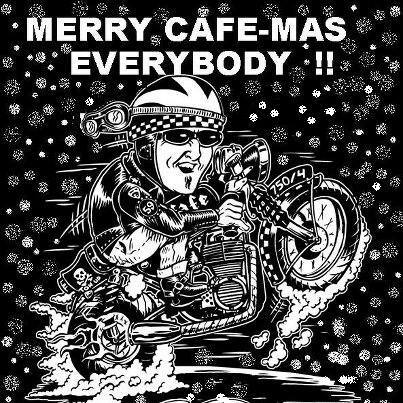 This entry was posted in Blog and tagged 59 club, ace cafe, bobber, bonneville, brat, BSA, cafe racer, chopper, Christmas spirit, classic motorcycle, Cool yule, custom, December 25th, Family gathering, father Christmas, festive, Honda, kawasaki, matchless, Merry Christmas, Merry Xmas, norton, rockers, Rudolph, scrambler, thruxton, thunderbird, ton up, tracker, triumph, vintage motorcycles, yamaha, Yule tidings. Some tunes to blow away the cold blues.